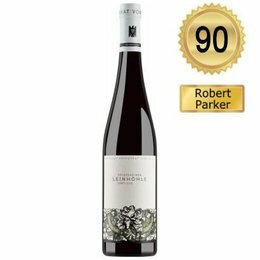 Nutty flavors and bright Riesling flavors open to the juicy, elegant 2014 Riesling Spätlese Deidesheimer Leinhöhle -- a sweet and piquant 8.5% alcohol Riesling with roughly 70 grams of unconverted sugar per liter, with a stimulating salinity in the finish. This is a delicate but still very young Spätlese that was kept on the full lees for eight months and bottled in April. This well balanced wine goes for ten to 20 years and will always be a light and filigreed, very refined Riesling for aperitif and lighter fish dishes. With Mathieu Kaufmann (former chef de cave at Bollinger) and Richard Grosche directing the prestigious 52-hectares domaine of the Niederberger imperium, Reichsrat von Buhl is one of the hot spots in the Pfalz today. Especially the Rieslings, which are bone dry and often with less than one gram of sweetness, belong to the very best that the Pfalz and all of Germany has to offer in the dry sector. These are terroir-driven wines made for the best restaurants in the world; these just still have to know it. Everything in the traditional domaine in Deidesheim has been recently renewed -- even the wine labels, which have been cleared up and dressed in stylish black and white like the interior decoration of the domaine. In the cellar, there is a mix of new oak barrels 225- to 2,400-liter and stainless steel tanks. For this prestigious domaine with its 25 hectares of grands and premiers crus, nothing seems too expensive. von Buhl owns the best plot in the Ungeheuer (of the 5.1 hectares, there are 3.6 hectares in the original 4 hectares Ungeheuer plot, which was classified in a map of 1828); but there are also excellent parcels in the Forster crus Pechstein (3.6 hectares), Jesuitengarten (1.8 hectares), Freundstück (1.5 hectares), Kirchenstück (.9 hectares), the Deidesheim Kieselberg (3.1 hectares) and the Ruppertsberg Reiterpfad (.9 hectaresin the Hofstück and .5 hectaresin the In der Hohl parcel). The first sparkling wines of Mathieu Kaufmann are lovely, clear, pure, finesse-full and already among the very best Sekts in all of Germany. The future of von Buhl looks very rosy, which had not been the case for ages.